A 20 percent chance of snow showers before 11pm. Mostly cloudy, with a low around -11. Wind chill values as low as -29. It is no night for streaking. It is frostbite weather. This morning it was nine degrees when we headed outside to meet the school bus, and windy. Our neighbors have a small pond just up the hill and it is not sealed well. It leaks, slowly, into the grasses next to our driveway. 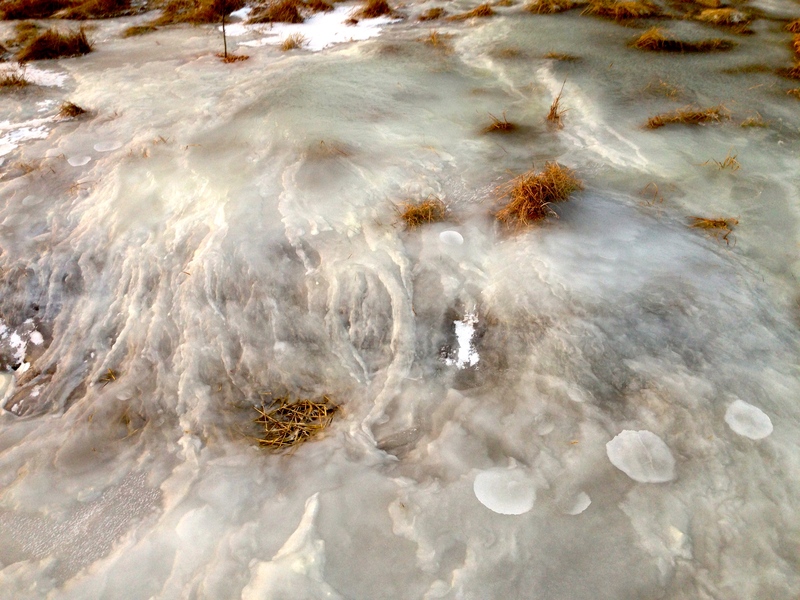 Until this winter, that slow seep flowed into our driveway and we had an icy hazard on the approach to the road. Since we had our driveway regraded last summer, and the ditch next to it re-dug, the seep fills the ditch. It is getting full now, as the water turns to ice. It is pretty cool to watch the ditch fill. 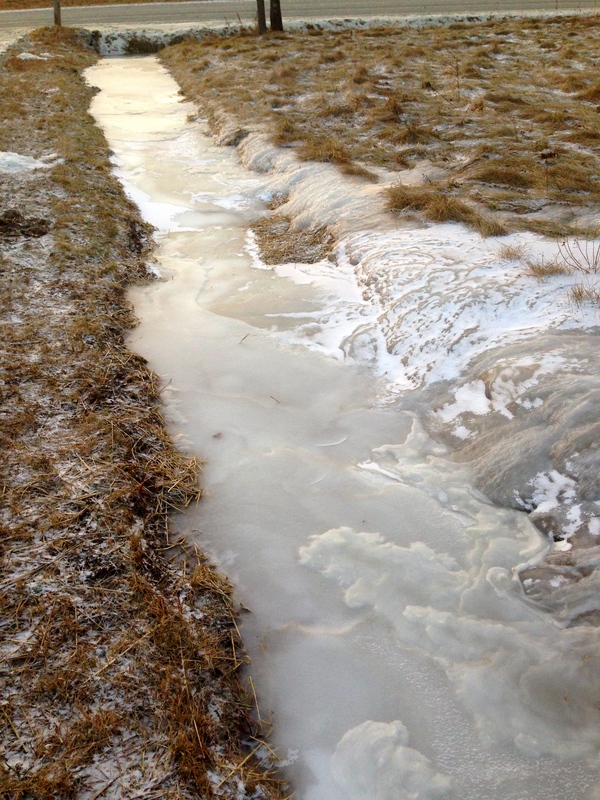 There is a slushy layer before the ice reaches the ditch, then it is like flowed land. I can’t tell you how happy I am that that is not in the driveway. The past couple of winters we have had some treacherous moments. We will have some cold days this week, but mostly seasonal weather. The forecast doesn’t call for any more sub-zero temps. Still, I don’t plan to be walking around in flip flops any time soon. I got a new down jacket for Christmas. I’ll be keeping that puppy handy. Plus boots. And a travel mug. Need to keep the inside warm, too, right? This entry was posted in weather, Winter and tagged cold, ice, weather, winter. Bookmark the permalink.